In January, we completed a significant grant from Gambling Awareness Nova Scotia that provided our main focus for the year. The project used creative arts to raise community awareness of gambling issues in partnership with local artists and art organizations. We also engaged the broader not-for-profit community in a day-long event that sought to find common cause in building healthy communities together. 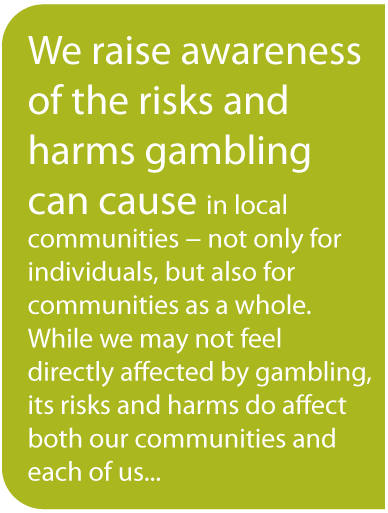 One of the biggest challenges for GRINS is to get across the concept of community impacts of gambling to the general public. Most people think only of individual harms. We partnered with Ross Creek Centre for the Arts to create an interactive theatre piece that engaged people in the unfolding of impact on the community as VLTs were introduced into the town. We were able to deliver this in a continuously updated form several times over the year. Several people commented that they grasped the higher-level impacts of gambling for the first time by playing out the roles. Another challenge is getting attention to the cause. We decided to take a playful approach and developed the Gertie the Gambolling Goat videos in collaboration with Creative Action video production. The rapping goat gave simple messages on YouTube, with the idea of sparking discussion in a non-threatening manner. We were very happy to have hired Anne Stieger to coordinate this project. Her expertise and experience enabled this project to flourish. Working with the Nova Scotia Health Research Foundation was very productive. We appreciated their assistance with ongoing evaluation of the project. We were able once again to have collaboration with NSCC Kingstec, where we piloted early versions of the “Our Gambling Town” interactive theatre production. We appreciate input from a younger age group. Our ongoing challenge is to engage more community members in the work and increase the active membership of our organization. We find the current grant-based funding policy in Nova Scotia very problematic, as it pits organizations in competition with one another, can direct away from core goals, and provides no opportunity for long term planning or sustainability. This puts stress on board and staff. We need to develop strategies to enable us to continually move towards our vison despite these limitations. Previous post: Our New Name and Website!